Being in the retail sector, a big part of our growth involved gaining ground by opening up many accessible showrooms for our customers to be able to find us with ease. Over the years many of our retail outlets have shot into prominence with one of them earning the unique distinction of being the largest textile showroom in India spread over a 10000 square feet area. 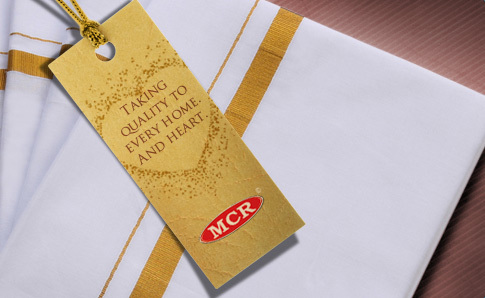 With an astounding 5000 showrooms across the two southern states of Kerala and Tamil Nadu, MCR has truly established itself as a household name and the preferred textile outlet of its ever expanding base of customers. Our retail stores are imbued with the right features that widen the scope of the establishment and serve a diverse purpose. Instead of serving as a mere retail outlet or a shop, we have shaped ourselves as the complete family apparel store. We strive to take the best of quality, variety, design and diversity and offer it to our valued customer. We aim to revolutionise fashion trends across the country with the style and substance of our cutting-edge clothing. A brand that has captured the hearts of a million consumers across the length and breadth of Kerala and Tamil Nadu. Infrastructure MCR's infrastructure is a combination of indigenous and contractual looms, engaging small-scale weavers from places like Erode, Thiruchengode, Komarapalayam, Pallipalayam and Somanur. About Magagement MCR has evolved as the leader in the Industry through the dynamic and inspiring leadership of M.C.Rixon and M.C.Robin. The brand MCR has been efficiently managed by the brothers ever since its inception.